You save $69.39 Over 44% saving! 1.1?Output:?Continuous current 120A, burst current 760A. With 1 cell Lipo or 3-4 cells NiMH, 1/12 on-road: >=2.5T? With?2 cells Lipo or 5-6 cells NiMH, 1/10 on-road: >=3.5T, 1/10 off-road:??>=5.5T???? 1/10, 1/12 on-road or off-road cars for competition race. 1.8?Size:?43mm(L) * 36mm(W) * 33mm(H). The cooling fan gets the power supply directly from the battery.?? 2.1?Built-in DC/DC booster. Perfectly works with 1-2 cells Lipo, so the single cell class racings such as 1/12 scale competitions are easily covered by this XERUN-120A-1S ESC without an additional receiver battery. 2.2 Compatible with all sonsorless brushless motors and most of?sensored brushless motors such as?LRP, Novak, Orion, Feigao, etc. 2.3 Seamlessly change to sensorless working mode when the sensor cable is broken.? 2.4?Excellent start-up, acceleration and linearity features. 2.5 Firmware updatable?through an USB adapter on the?Advanced?LCD?Program Box?(Optional? equipment). 2.6 User programmable. 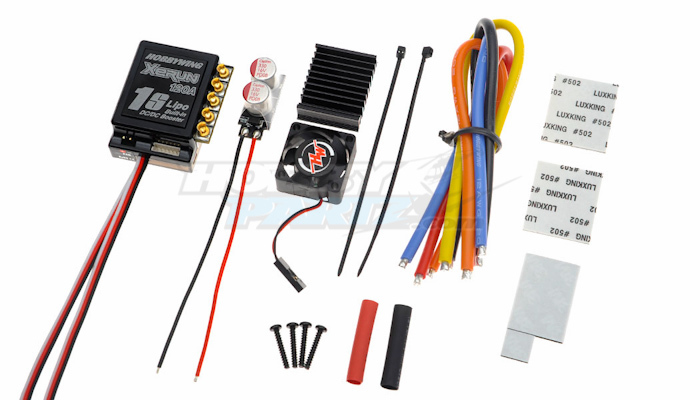 Plenty of programmable items make the ESC suitable for each racing.? 2.7 Easily programmed with the ?SET? button on the ESC, and also compatible with the?compatible with?theDigital LED Program Card?and the?Advanced?LCD?Program Box. 2.8 Multiple protection features: Low voltage cut-off protection / Over-heat protection / Throttle signal loss protection / Motor blocked protection. ?